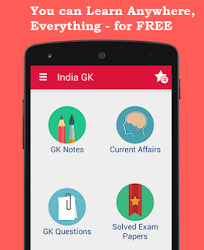 29th, 30th, 31st December 2015 Current Affairs MCQs, Quiz, Questions: Current Affairs Daily Multiple Choice Questions (MCQs) for India GK, World GK and current affairs with Collection of daily objective type Question by www.Indiagk.net based on General Knowledge (GK) and General Science (GS) Questions for UPSC, State PSC, SSC, Police exam, Railway exam, SBI, Bank PO, IBPC, SSC, LDC, UDC, Army, Airforce, Navy, Coast Guard, Bank Clerk, TET and all entrance examination with current affairs News, Multiple Choice Questions (MCQs) available on Website www.IndiaGK.net and Android Apps with daily updates:. National Conference of Dalit Entrepreneurs was inaugurated by ? Which team wins maiden Vijay Hazare Trophy 2015 ? Who is appointed Director General of National Centre for Good Governance ? Who is appointed CEO of NITI Aayog ? Which Gujarati Litterateur honoured with 51st Jnanpith Award 2015 ?